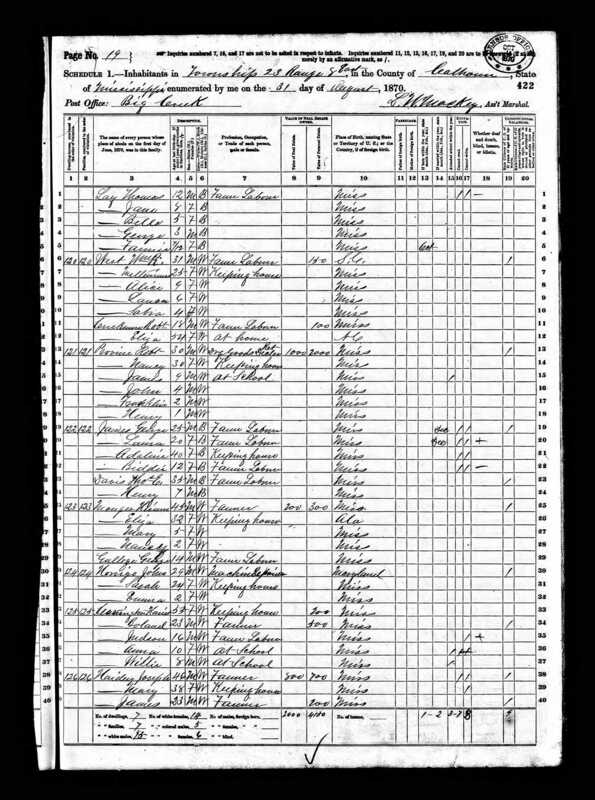 1) Joseph Findley Provine b. Nov 23, 1860 – d. , m. Josie V. Wright , married on Feb 10, 1885 – lived in Coffeeville, Miss. 3) Robert Foster Provine b. Nov 15, 1867 – , m. Emma Boland. Married on Sept 27, 1892. 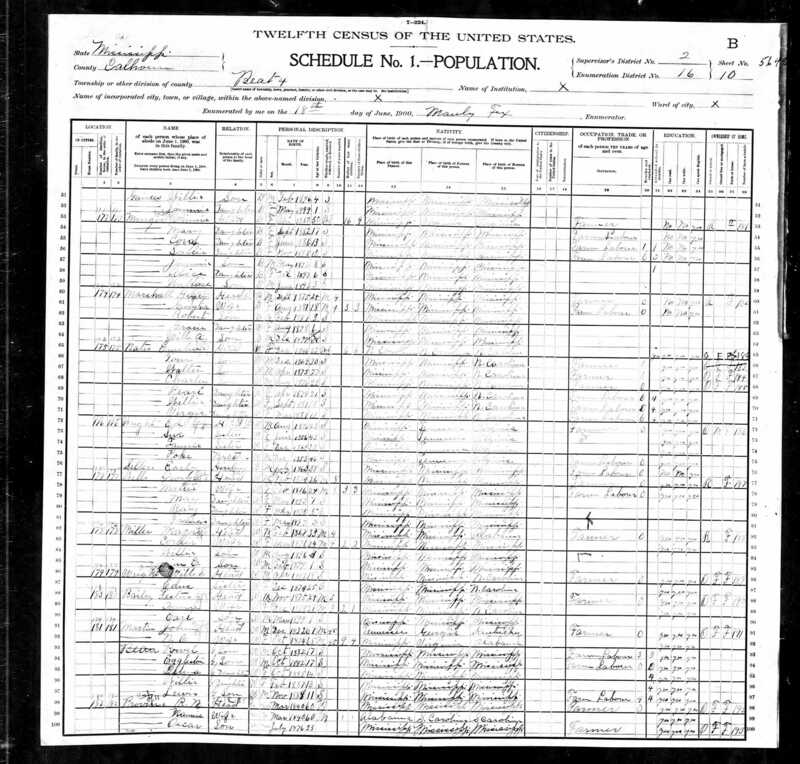 5) George Hiram Provine b. Aug 9, 1871 m. Marguerite Thompson b. ? – d. Aug 28, 1958. 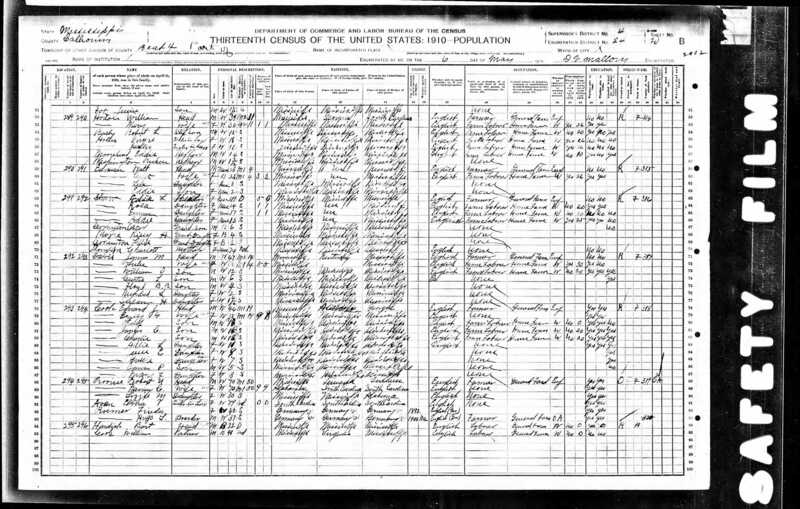 Married Feb 16, 1898 in McKinney, Texas – living on farm there. 6) James Neely Provine b. June 13, 1873 m. Fannie Jones . Married on Jan 4, 1900. 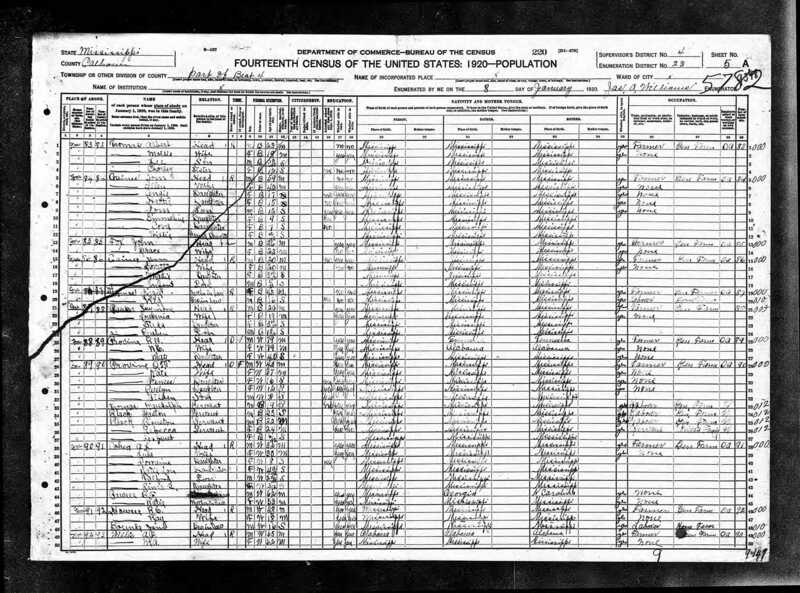 8) Oscar Tilden Provine b. July 14, 1876 d. Nov 18, 1956 in Calhoun, Miss. m. Kate Denley. Married in 1902 in Big Creek, Miss. Nancy Chisholm Goyen b. 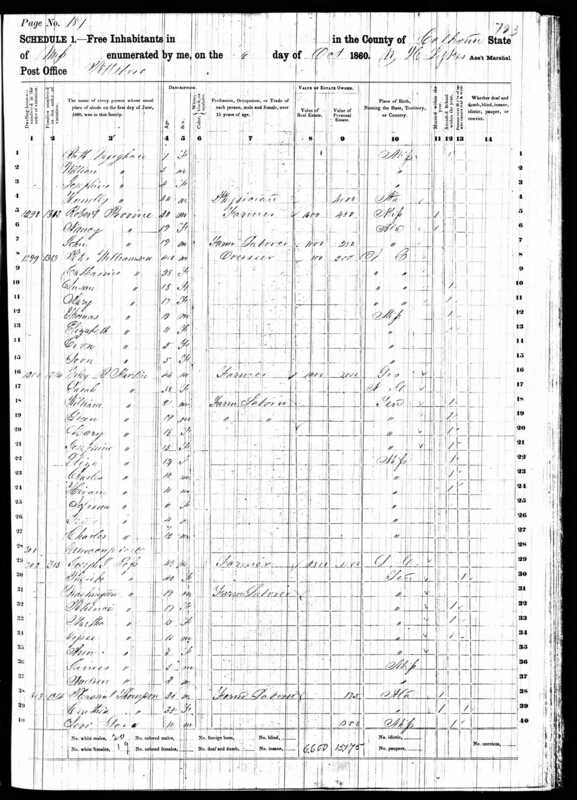 March 25, 1840 in Pickens Co, Ala. – d. Nov 20, 1922 in Coles Creek, Miss – Married Robert Neely Provine b. 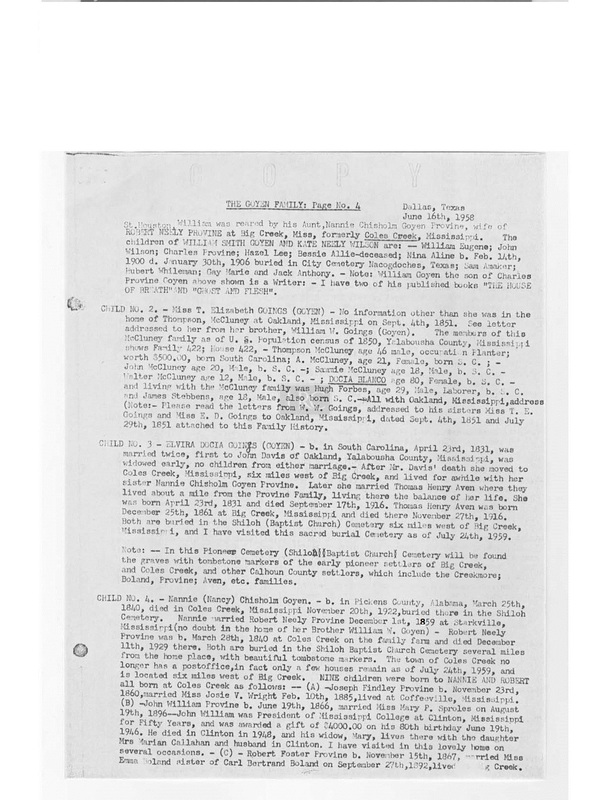 March 28, 1840 at Coles Creek – d. Dec 11, 1929. Married on Dec 1, 1859 in Starkville, Miss. Both buried in Shiloh Cemetery. (Photos of Nancy Goyen and husband Robert N. Provine). 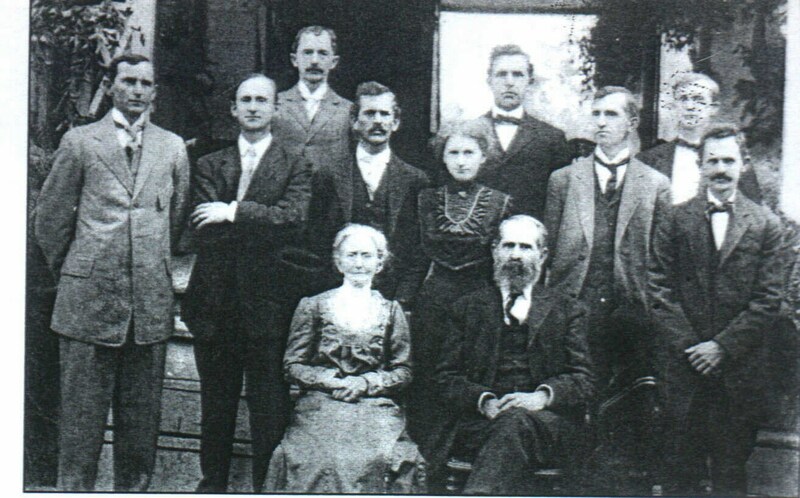 (Robert Neely Provine with wife Nancy Goyen Provine, and all their children – far left is Joseph Finley Provine, next to him is John William Provine). 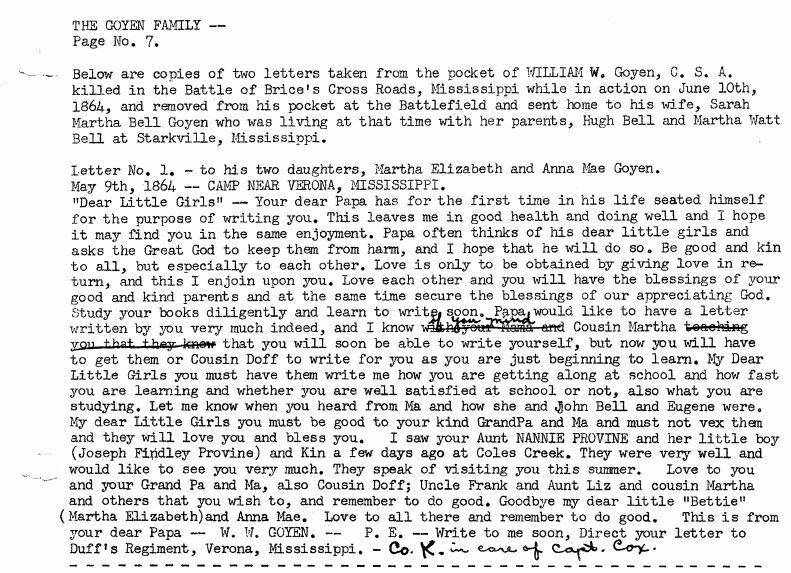 We know from William W. Goyen’s letters that were written in the Civil War (found on his body and delivered to his wife after his death) that his sister was Nancy Goyen who married into the Provine family. 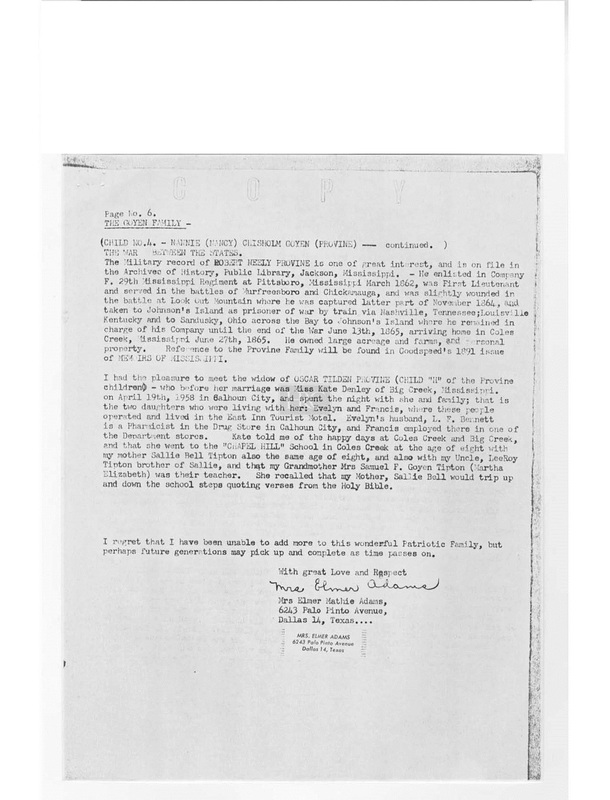 (In letter named “Nannie Provine” with her son “Joseph Findley Provine”). 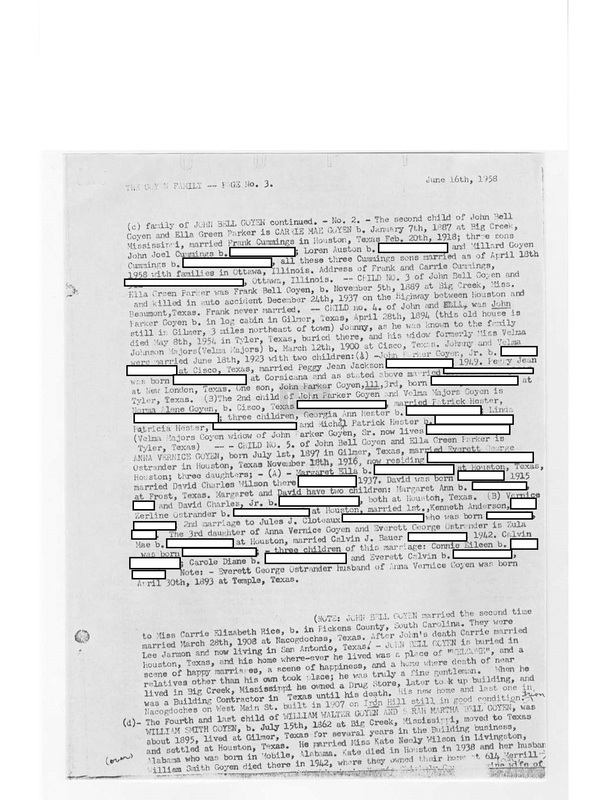 (Transcription of W W Goyen letters dated May 9, 1864 and June 7, 1864. 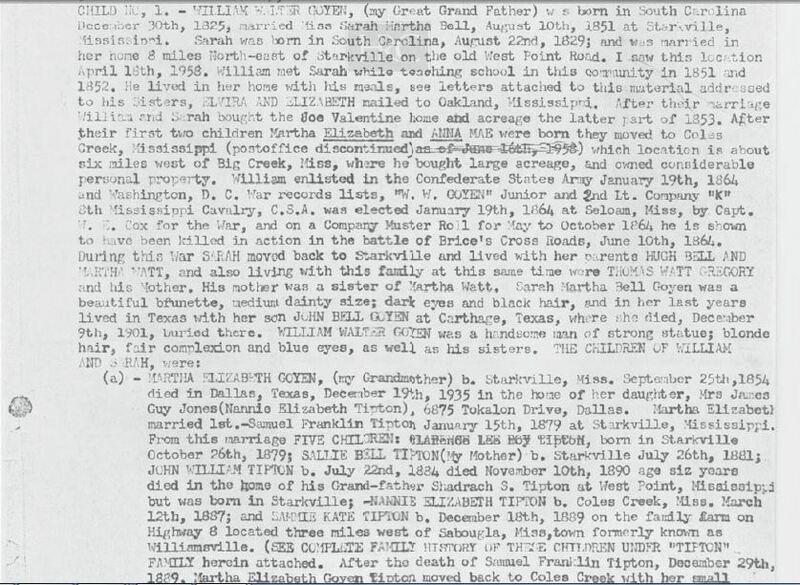 They were found on his body after killed at Battle of Brice’s Crossroads on June 10, 1864 – Letters were taken from his pocket and delivered to his wife Sarah Bell Goyen – Originals are listed below under “Events” – difficult to read). 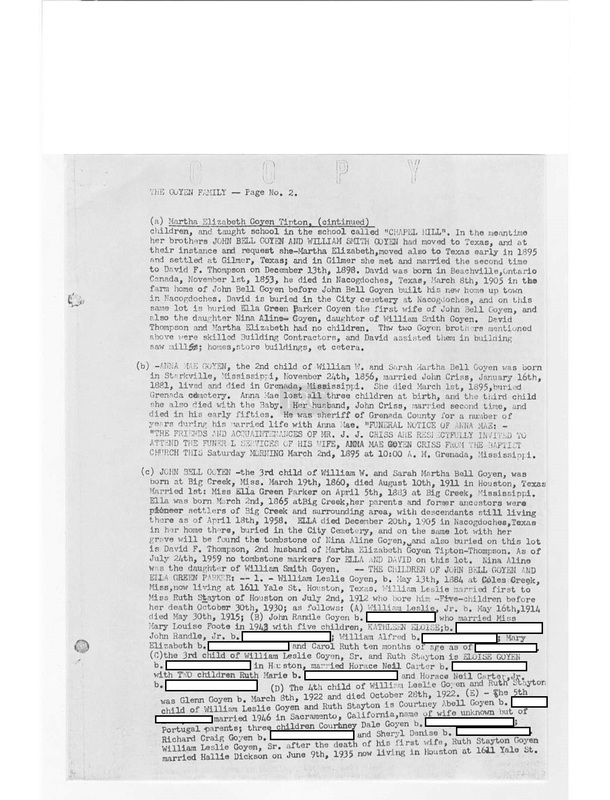 Nancy Goyen is mentioned in “Biographical and Historical Memoirs of Mississippi: Embracing an Authentic and Comprehensive Account of the Chief Events in the History of the State and a Record of the Lives of Many of the Most Worthy and Illustrious Families and Individuals”. Information from the article shows she was born in 1840 a native of Pickens, Alabama. She was an orphan at an early age and raised by her brothers and sisters, and married Robert Neely Provine at age 20. 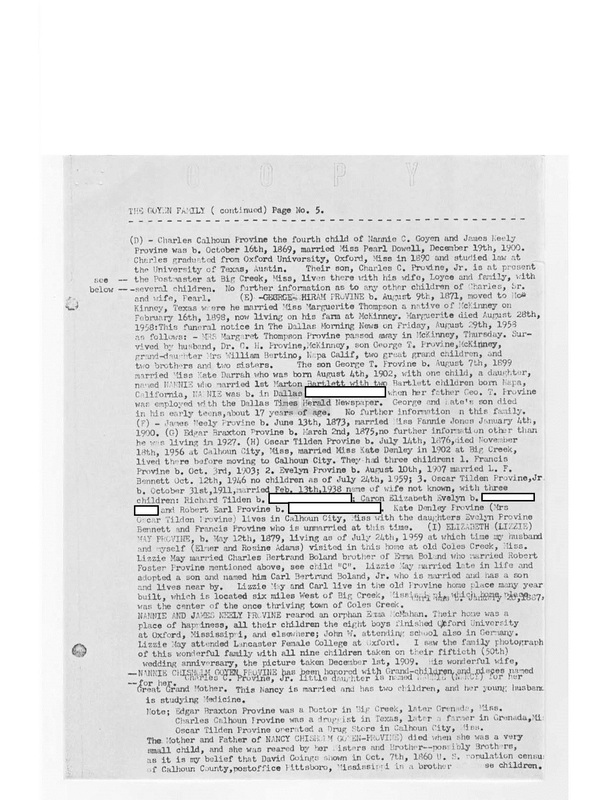 Nancy Goyen and Robert N. Provine had 9 children, 8 sons and 1 daughter.